We are happy to launch the information for the first four weeks workshop with David Zambrano to be held at TICTAC art centre, Brussels, Belgium. The dates are from 3rd of February until 3rd of March 2019. For one whole month, we will deepen the techniques of Flying Low and Passing Through, guided by their author himself, David Zambrano. We will facilitate a context to study his work closely and passionately, diving into an extensive- intensive learning experience, to achieve deep knowledge of Flying Low and Passing Through techniques, both transmitted by Zambrano and assisted by Florian Vuille and Milan Herich. 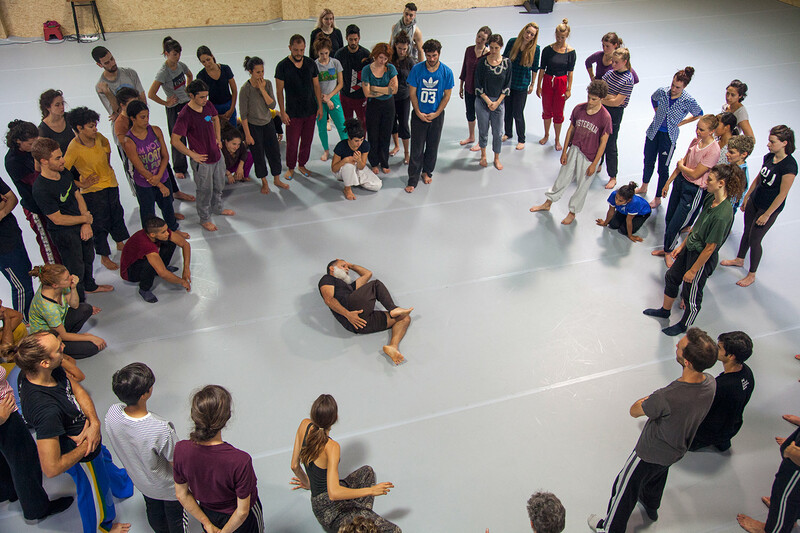 This workshop focuses mainly on the dancer’s relationship with the floor. The class utilises simple movement patterns that involve breathing, speed and the release of energy throughout the body in order to activate the relationship between the centre and the joints, moving in and out of the ground more efficiently by maintaining a centred state. There is a focus on the skeletal structure that will help improve the dancers physical perception and alertness. The class includes partnering work and movement phrases, which explore the primary laws of physics: cohesion and expansion. The class begins in stillness and students are asked to read their body in a standing position. They are urged to connect their entire bodies with the environment: the air, floor, and the energy of others, forming an interconnection by just standing. When one is standing, the whole room is standing with one. When one is moving, the whole room is moving with one. The image of the body constantly spiralling, whether running dancing, walking dancing or standing dancing is the main practice during the whole class. Working with spirals helps the dancers go into the floor and out of the floor with ease, and also helps the dancers to see themselves and the room from all sides. The spirals propel the class all over the room, both on the ground and upright. This is the flying low technique. In the making of movement compositions, David Zambrano focuses on creating and developing the dynamics for complex systems to present leadership in the form of a group web. In science, cells do not need a protein leader to create life. Neither does the brain need one protein leader to create a thought. With this in mind, Zambrano thinks that movement needs no leader in creation. The “passing through” takes students through various exercises to manifest that same philosophy. The group will create dynamics that will be flexible, complex, getting the group to fit tight together, yet always keeping doors open for the unexpected. The group moves constantly, transforming the environment of the dance. After taking part in the “passing through” the student will learn to instantly connect with their environment and become more spontaneous in the making of choices as an improviser, choreographer or dancing in someone else’s work. Zambrano uses three main exercises to complete this training. Under, over and around enables the student to make instantaneous creative choices as well as increases flexibility in both the mind and body. It is a very physical game that requires a lot of endurance in which the full body of the student goes under, over and around the bodies of other students. Zambrano allows no time to take to make a plan, therefore the student learns the choosing and doing as one. By the end, dancers will dissolve into other dancers as one with the environment. With leading and following, the students use their bodies to constantly exchange the roles of leader and follower. They do so unprompted, according to their instantaneous individual needs. The student must focus on either leading or following, how and when to make the choice to change, and how to control their body while doing so. An image that Zambrano uses is to lead and follow as balls of light, where there is non-specific gender and non-specific front of the body. The student can never get lost because they are constantly leading or following. From an outside vantage point the group give the appearance that it is moving without a leader or a follower while truthfully, everyone is leading and/or following. The workshop culminates when Zambrano asks the students to see the room full of pathways – infinite system of curved pathways in a finite environment passing through the walls, the floor, even the bodies. These pathways go in any direction and are filled with curves, large, medium and small curves. When any student moves, he/she becomes a pathway. Thus the “passing through” is created into a spontaneous composition. When the group becomes one mind, it can never get lost. The whole group is constantly traveling, weaving their bodies inside and out of their classmates and still always aware of the environment around them. David Zambrano has been a monumental figure in the international dance community for more than a quarter century, and his passion for cultural exchange continues to influence his work. Zambrano is an ambassador and liaison across many borders, bringing together artists from all over the planet for his projects. He has taught his own approach to dance in more than 70 countries, and has performed at hundreds of venues across the world. His pieces range from set choreography, structured improvisation, and pure improvisation. Born in Venezuela, Zambrano spent 15 years in New York, and now lives in between Amsterdam and Brussels. Besides David Zambrano directing the whole month event, assisted by Florian Vuille and Milan Herich, also will be invited 2 bodyworkers who will offer a wake-up training in the mornings and cooling down or stretching afterwards at eve, which is included in the price. Probably in the line of QiGong and Yoga. Also masseurs will be available in the centre to ask for assistance when needed. They all will be introduced to you at the beginning of the workshop. During the intensive we will provide open space for the participants to perform every Saturday evening. At the final will also be a Passing Through presentation open to the general public. Healthy protein rich vega Lunch and Dinner are included in the price as well. People who apply needs to already have some experience in Flying Low, either by Zambrano or by someone who studied with Zambrano intensively. There will be a selection procedure. When you register at the email address, you will receive a reply with a form. You will have to fill in the questions regarding your history as an artist and your experience in Flying Low, Passing Through and studying or working with David Zambrano or someone who has worked close to him or his work.